Since I started using cloth diapers 4 1/2 months ago on Kate, I've had several people give me a look of shock, and others give a "how on earth" look. So, I thought I'd humor you and give a photo how-to on them! Exciting, huh? Here's my usual stash. 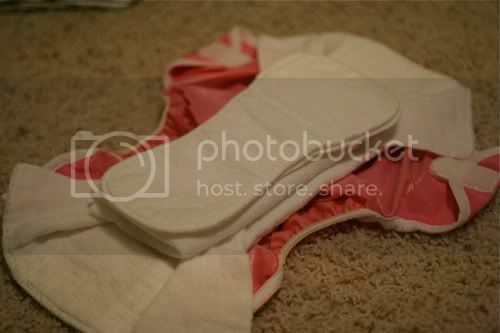 I use cheapo Gerber prefolded cloth diapers, Gerber birdseye cloth diapers (the thin ones as liners), and Kushi brand contoured liners for added absorbency. 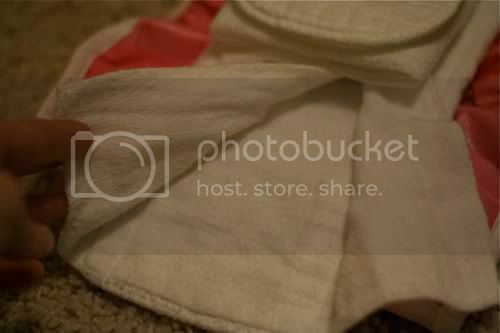 Start with a diaper cover like this one from Thirsties brand. 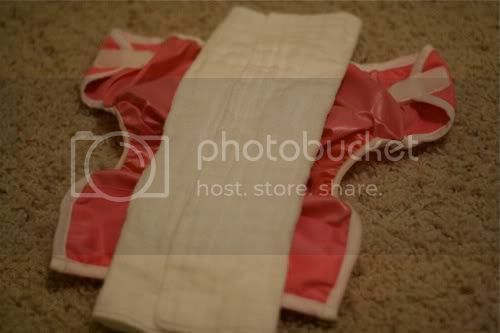 Place the thick prefolded diaper down first, with the thin edges folded in. 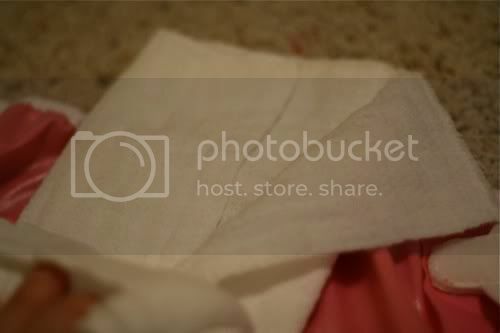 Add the thin birdseye diaper (tri-folded length-wise) and the contoured liner. Unfold the very ends only of the bottom thick diaper on both ends. Now you're ready to add the baby! When I first tried these out, I thought for sure I'd hate it, but I wanted to be able to say I had at least tried them. Days went by and I just kept using them. I ordered a few more covers and was surprised at how not-so-disgusting or difficult it was. I figure since I'm fortunate enough to be home with my kids and have a washer/dryer, I might as well save money. I'm no Nazi about these, either! I use disposables when we go out and if someone else is going to watch her. (And I don't make my mom or my mom-in-law use them!) I use cloth when we have a family outing if I'm feeling thrifty, but mostly, I use them at home. I have no idea how much money we've saved, but I think we've actually felt the relief from buying so many disposables. Never in my craziest dream did I think I'd use these, so that shows you anything's possible! Cleaning them is even not too terrible. 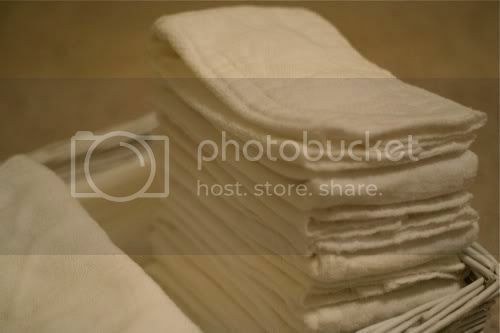 I keep a pail of detergent water in the laundry closet and soak them until I wash them all. I have a pressure sprayer on the shower head that I use to get the "stuff" off them and into the toilet. Not too bad, really. So, that's how I got into this mess...literally. Thanks for posting this. 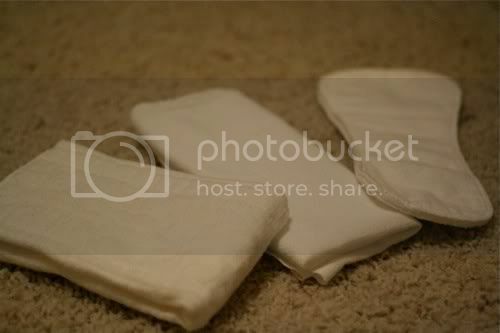 It is great to see more moms sharing how cloth diapers work. Thirsties covers have been a best seller for me from the very beginning (Thirsties was one of the first brands I carried when I opened my store almost 4 years ago). I would like to point out though, that the Gerber prefolds you are using have polyester in the middle. If you use 100% cotton prefolds (such as Indian or Chinese prefolds), you won' need to add so much bulk to get the absorbency you need. While diaper service quality prefolds do cost a little more upfront $20-24 a dozen) they are so much more absorbent and thus easier to use! A package with 24 diapers and 4 Thirsties covers is still only about $90 with shipping and will last for more than one child if they are cared for well. wow, I always wondered how that worked. But it sure doesn't look like it's for me though! 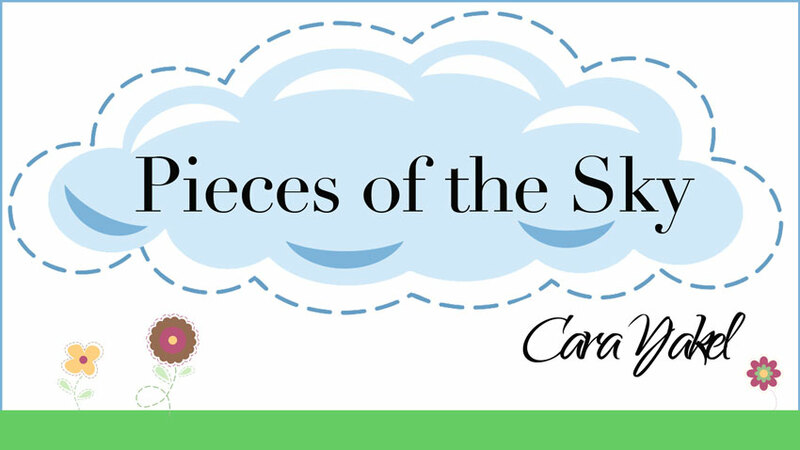 Yay Cara! I think it is a wonderful concept, one that should be considered by all SAHM's. Of course when you very first hear about it it seems to be pretty out there in todays culture but if you seriously consider the benefits it seems much more realistic. The $$$ that is saved is worth it alone. 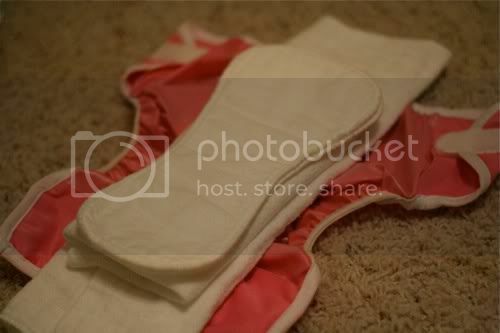 Plus they have some really cute covers now that make them more attractive than your disposable diapers. I think as SAHM's we need to help find ways to make money which for us means saving money. That is our financial contribution to our families. You are being very wise and I think God would say this is one great example of being a good steward of His money. I plan on attempting this when baby #3 gets here. I will be calling on your for encouragement. thanks for posting this, I found it through a google images search and liked the article so well I started reading the rest of your blog and now I follow your blog posts through Twitter. Thanks for the how-to! Thanks, everyone, for your encouragement! ANONYMOUS: Washing the diapers is a cinch. Just dump them out into the washer and first run a COLD rinse cycle. After that, do the actual wash cycle, which I do on hot water. I add a cup of vinegar, too. It's super easy, and I don't see why this wouldn't be okay for a HE washer. So glad this helped. And CLOTH DIAPERS: thank you for the advice on prefolds. This post is old by now, and I'm now on baby #3 and using cloth with him as I can. I'll have to see about some of the 100% cotton prefolds soon! Thanks for sharing, everyone! I also just stumbled upon your wonderful blog. 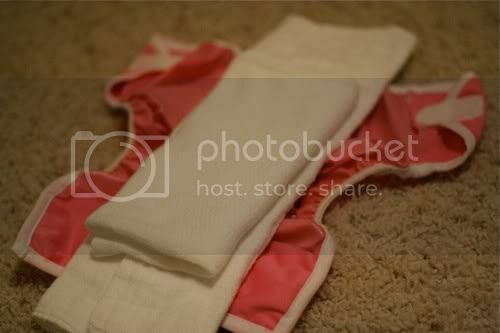 Our little bean is due in June and I want to cloth diaper. The pics are really helpful! I'm going to try to use all American-made baby products, too. And the peace of our Savior to you, too!